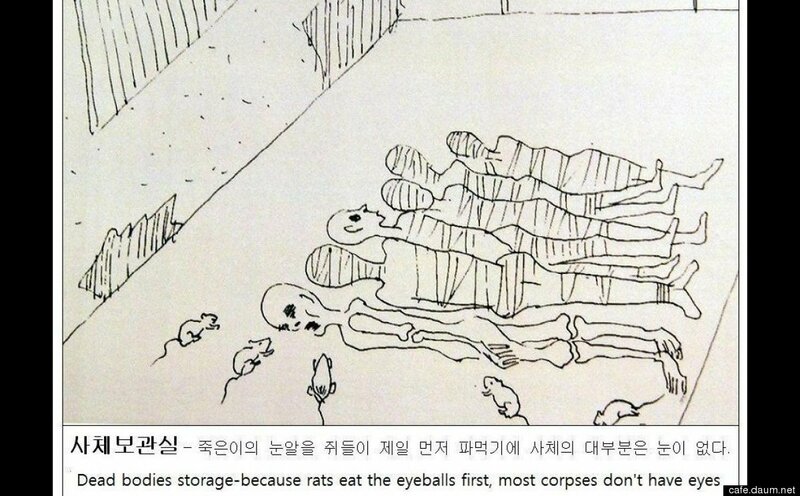 "[B]ecause rats eat the eyeballs first, most corpses don't have eyes," reads the caption on a morbid picture purportedly drawn by a North Korean defector who spent time in one of the country's brutal prison camps. Reddit user ryanyang translated the captions from pictures drawn by several individuals reportedly depicting daily life in North Korean prison camp. WARNING: Drawings below contain graphic content. North Korea is notorious for its human rights abuses, including prison camps where "hundreds of thousands of people [were] detained" under Kim Jong Il, according to Amnesty International. The Guardian reports that North Korea is thought to have expanded its political prison camps "substantially" over the past decade. The first two drawings below include translations. You can see the full collection (in Korean) here.